Over half of the Tongass National Forest is federally protected from road construction. The so-called “Roadless Rule” has been in place since 2001 and the subject of nearly-continuous litigation since then. But now, the state has petitioned the Forest Service to craft an Alaska-specific rule that would make way for economic development in the Tongass. 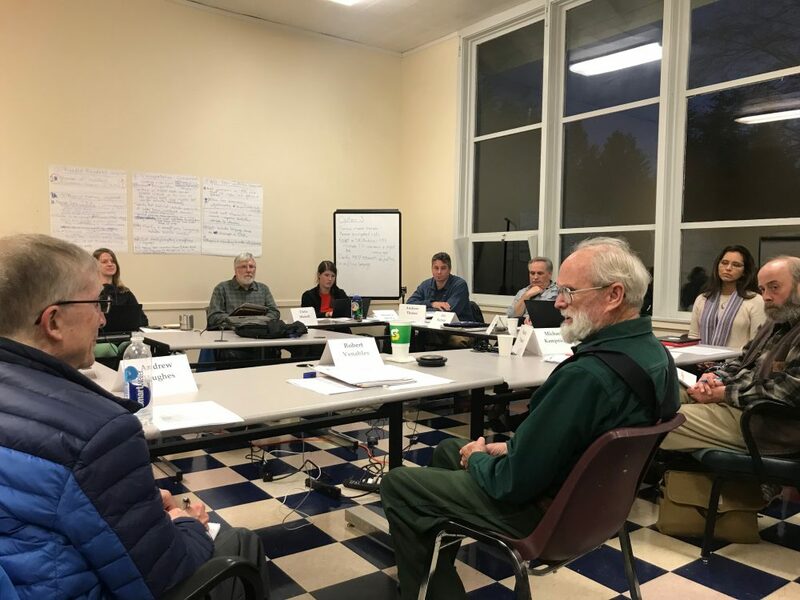 At a committee hearing in Sitka Tuesday night, many commented that the federal Roadless Rule – and the trees it protects – should stay untouched. The scene is a square conference table in the Yaw Arts Building, windows facing a darkening forest. Seated around the table are the twelve members of the Alaska Roadless Rule Citizen Advisory Committee appointed by Governor Bill Walker. And they’re taking comments from the public — all of whom call for non-action. Some are from Sitka, some from Prince of Wales Island. Others are calling in over the phone from Klawock and Tenakee Springs. Those commenting are saying they want to maintain prohibitions for road building in specific areas of the Tongass, essentially blocking development for logging and mining. Clarice Johnson’s grandfather was a logger during the heyday of old growth timber, when cutting down old trees was good economics. Johnson told the committee that times have changed. “Eliminating the Roadless Rule will not bring back the logging industry. It will only endanger the other drivers of the Southeast economy,” Johnson said. Drivers for Johnson include fishing and tourism, which rely on intact watersheds and roadless areas. Jeff Arndt pointed out that logging makes up a far smaller portion of the economy than it once did. “Timber contributes less than 1% to the jobs and the economy of Southeast Alaska compared to about 25% of fishing and tourism,” Arndt said, citing numbers in the 2017 Southeast by the Numbers report. Bethany Goodrich concluded that Southeast entrepreneurship, from wildlife viewing charters to a kelp salsa business, requires a Tongass without roads. “People are not intrigued by Alaskan products because of clear cuts and conflict. My clients aren’t asking me to brand them as embedded in a timber farm. Through their businesses they want to share their identity, their culture, their cherished home with the world and with their customers. I am not anti-timber. But I resent that the timber industry feels like the mono-focus that drives our land management decisions today,” Goodrich told the committee. Some comments supported one area of development – responsible hydroelectric development. Others simply felt that the Tongass needed as many trees in the ground as possible to sequester carbon emissions. Several called for the new Roadless Rule to be even more restrictive for development, including all T77 watersheds and TNC/Audubon ecological priority areas that are currently not part of the roadless areas inventory. The twelve members of the advisory committee took all of this in, some scribbling down notes. State Forester Chris Maisch is a part of the committee too. The rest on the committee have some kind of commercial or ecological interest in the Tongass. Their mandate from Governor Bill Walker is to submit a report of what an Alaska-specific Roadless Rule would look like. They could take no action, like many in this audience hope, or they could exempt the whole Tongass from the federal Roadless Rule, opening the door for development. Also possible are middleground options. This committee is exploring a menu of new stipulations for mining, timber, transportation, renewable energy development and more. The committee meets in Sitka through November 8th. They’ll continue to develop those options and submit their report to Governor Walker by November 30th.